You Are Here: Home » Sports » Chris Sale Dominates for Red Sox in Series Opening Win Against Royals in Kansas City. Chris Sale Dominates for Red Sox in Series Opening Win Against Royals in Kansas City. Coming off an off day on Thursday, the Red Sox took to Kauffman Stadium in Kansas City, MO to take on the 25-61 Royals. Having already taken two out of three from them earlier this season at Fenway Park, the Red Sox, led by Chris Sale, were looking to end a nine game road trip on a positive note. Making his 19th start of the season on Friday, Sale carried over the dominance he displayed throughout the month of June in another great showing. In what was his shortest start since June 13th, the lefty went six innings deep in this one, surrendering just one run on five hits and one walk while fanning 12 Royals on the night. By the time Sale took the mound for the first time in the bottom half of the first, his team had already gotten him four runs of support. And an inning later, that lead inflated all the way up to eight runs. So, the 29 year-old was never under much duress on Friday night, and the Royals only got to him once, on a Alcides Escobar RBI single, in the second, in six frames of work. Finishing with a final pitch count of 99 (65 strikes), Sale displayed his full range of abilities with a fine defensive play in his final inning. Out of those 99 pitches, the Florida native went to his nasty slider 43 times, which resulted in nine swinging strikes and 10 called strikes. He also topped out at 100.3 MPH with his four-seam fastball in the second inning. A performance worthy of his ninth winning decision of the season, Sale reached a milestone with his 100th career win as well. He’ll look to build on this start, and make even more of a case to get his third consecutive nod for the AL in the All-Star Game, in his next time out, which should come against the Texas Rangers back at home on Wednesday. 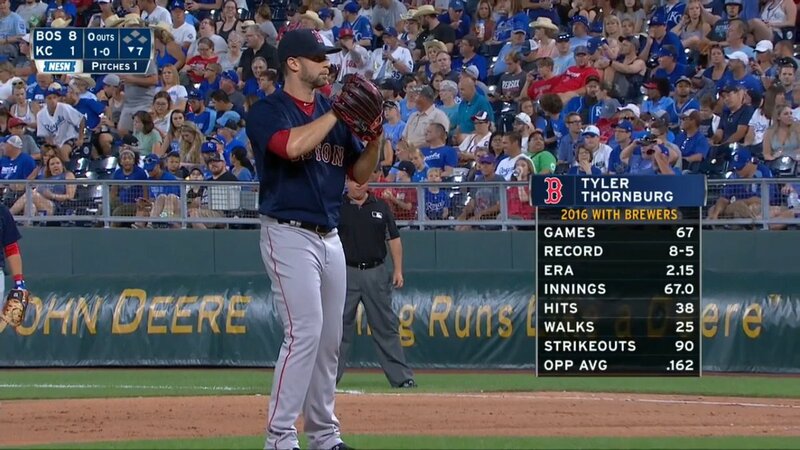 In relief of Sale, we got our first look at Tyler Thornburg in a Red Sox uniform, and in case you were not able to catch it, I can confirm that he is a real person. Making his first appearance with the club since being acquired from the Milwaukee Brewers prior to the 2017 season, Thornburg gave up one run in the lone inning he pitched in the seventh. Granted, a Lucas Duda leadoff triple probably should have been a leadoff double had Mookie Betts not misplayed the ball in right field, but other than that, it certainly was not the worst relief appearance these eyes have seen. From that point on, Brandon Workman gave up a two-run home run to Mike Moustakas in the eighth, and Hector Velazquez gave up one run on a Whit Merrifield RBI single in the ninth to make it a 10-5 game, while also picking up the final out to ensure his teams 60th win of the season. On the other side of things, the Red Sox lineup got to Royals starter Jason Hammel right away in this one. In his only other start against Boston this season, Hammel surrendered eight runs on nine hits in 4.2 innings pitched back on April 30th. On Friday night, the righty got hit hard once again, but did not make it into the fifth inning. Leading the night off as he typically does, Mookie Betts took the third pitch he saw from Hammel and launched it 410 feet to left center for his 22nd long ball of the season. In the process of doing that, not only did Betts put his team on the board first, but that homer was also good for the 100th of the outfielder’s career. Four batters later, Brock Holt came to the plate with the bases loaded, and he took advantage of that by ripping an RBI single to right field to score JD Martinez from third and Steve Pearce from second. Another two batters later, Sandy Leon put the exclamation point on an exciting opening frame by lining an RBI single of his own to right, scoring Xander Bogaerts from third for his teams fourth run of the night already. In the second, with Hammel still on the mound for Kansas City, a pair of two-run home runs off the bats of JD Martinez (27) and Xander Bogaerts (14) doubled the Red Sox lead to eight heading into the bottom half of the inning. Fast forward all the way to the eighth, and Jackie Bradley Jr. collected his 26th RBI of the season to score Eduardo Nunez from third for the ninth run of the night. An inning later, Steve Pearce capped off his three-hit night with an RBI double to score Blake Swihart and put his new teams 10th and final run on the board. From @SoxNotes: Chris Sale is in line to earn the 100th win of his career. In his last 6 starts, he has a 1.10 ERA. He has not allowed a HR in his last 44.0 innings, the longest streak of his career. It is July 7th, JD Martinez is slashing .328/.392/.647 with 27 HR and 73 RBI. The Red Sox are also the only team in all of baseball with 60 wins. Looking to rebound from an ugly outing against the Yankees last Sunday, David Price will get the ball for the middle game of this weekend series later tonight. He’ll be matched up against Royals righty Brad Keller, who initially started the season as a reliever, but has since transitioned into a starting role with the club. First pitch is scheduled for 7:15 PM ET on FOX.